Posted by Cora Hall on February 2, 2019 in Hockey, Sports, Top Stories. It was one step forward, two steps back all night for the Bulldogs and they failed to create momentum in the loss to Lake Superior State University (LSSU) Friday, Feb. 1. The Bulldogs headed into the weekend coming off a huge shutout win against No. 9 Bowling Green State University to face their in-state rival for the first time this season. After striking first with a goal from Ferris sophomore forward Frankie Melton, the Bulldogs fell behind rather quickly. Seconds after the goal was scored, Ferris sophomore forward Coale Norris was called for a major penalty for contact to the head. Norris was ejected from the game and LSSU gained a five-minute power play, during which they scored twice and a third time right after it ended. The Lakers would go up 6-1 before Ferris responded with just minutes left in the game to make the final score 6-3. Ferris head coach Bob Daniels expressed his dissatisfaction with how his team responded to falling behind, especially during the power play in the second period when Ferris gained a five-on-three advantage power play but did not capitalize. Going into the matchup, the Lakers were ranked No. 18 in the nation in the United States College Hockey online poll and No. 5 in the Western Collegiate Hockey Association (WCHA) standings with a conference record of 11-7-2. Ferris stood at No. 9 in WCHA standings with a conference record of 4-13-1. The Bulldogs struggled to fight through the five-minute man-down play and LSSU freshman forward Ashton Calder netted his first of the game with just over a minute left in first. Calder would score a second time on the power play two minutes into the second period and was followed in quick succession by LSSU senior forward Diego Cuglietta at three minutes to boost the Lakers’ lead to 3-1 in the second. 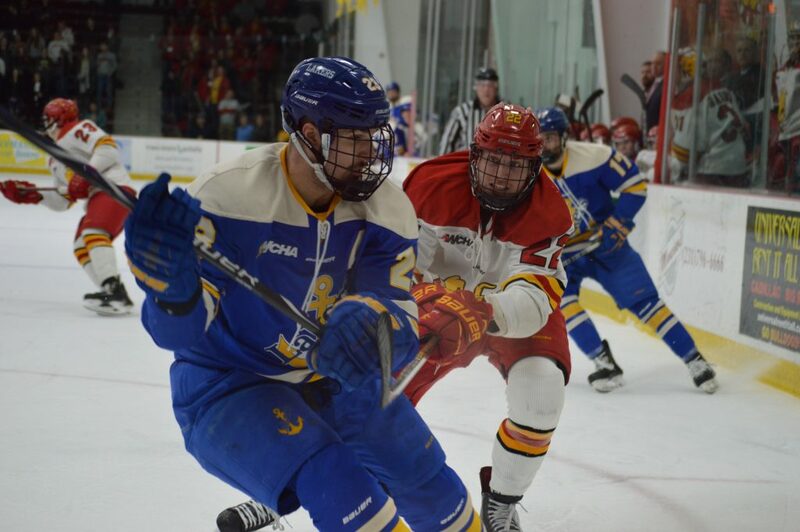 Ferris was unable to answer the Lakers and they would rack up three more goals: one by LSSU senior forward Gage Torrel and two by LSSU senior forward Anthony Nellis, one on a power play. The last few minutes would prove to be productive for the Bulldogs as two power play goals were scored, the first by senior defenseman Ryker Killins, assisted by freshman defenseman Cooper Zech and senior forward Corey Mackin; the second from junior defenseman Joe Rutkowski, assisted by junior defenseman Cameron Clarke. Ferris came out on top in the shot count with 35 to LSSU’s 30, but Ferris junior goaltender Justin Kapelmaster only saved 24 of them. Daniels felt the team became too selfish on the ice and it led to them failing to make it count when it mattered. The puck will drop 7:07 p.m. Saturday, Feb. 2, in the second night of the home series against LSSU.